Jacob Pins was born in Höxter, Germany and immigrated to Palestine in 1936 at the age of twenty. After studying under German emigre Jacob Reinhardt (1941-45), he became a noted exponent of the woodcut, developing a highly personal style influenced by both German expressionism and traditional Japanese wood block printing. In his introduction to the volume of Pins' 'Landscapes', published in Tel Aviv in 1955, Eugene Kolb, Director of The Tel Aviv Museum, observed that the artist had 'worked out a technique of his own and fashioned himself a personal form of expression', which gained him a high reputation in both Israel and the United States. From 1956 to 1977, Pins also taught at Israel's leading art schools, most notably Bezalel, where he later became a professor. Celebrated as one of Israel's 'foremost woodcutters', he was also a noted collector. 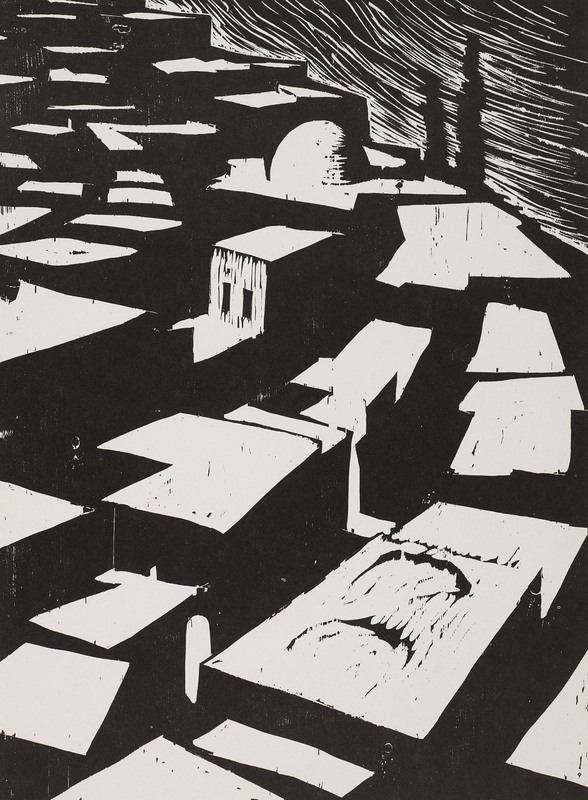 'Roofs' (1972) is reproduced as illustration no. 9 in Jacob Pins' volume 'Ten Woodcuts', published in 1972 by Lion the Printer in Tel Aviv, Israel, with a foreword by Elisheva Cohen, Chief Curator of the Israel Museum.